A job description describes what a specific position is all about and the tasks covered by the job title. They are very brief and are statements that are straight to the point. The HR department of a company makes use of these statements for job postings and job advertisements in the hopes that potential candidates will be attracted to apply for the position. It will also serve as a tool for evaluating whether an employee is able to do his/her job properly. 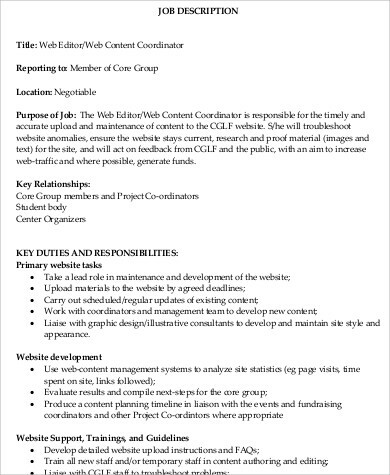 If your company is looking for a web editor, we have nine Job Description Samples that will help you write an impressive and attractive job description. Check out the samples below. Listed below are the qualities that a web editor must have in order to be an effective one. 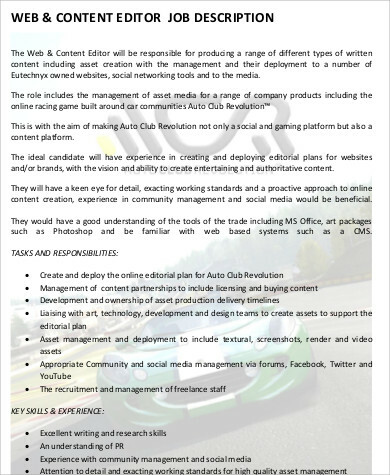 Can create/produce content in a creative and skillful manner. Must have a good eye for errors in grammar, spellings, and punctuation marks. Must be organized in order to compile sources and create contents in an efficient manner. Must check the accuracy of the website posts and must be able to identify the correct keywords to make use of in order to create a good amount of traffic for the website. Must be able to follow the copyright regulations in order to avoid having any plagiarized content in the website. Must be able to adapt to any Web developments in order to keep the website up-to-date. These are just some of the qualities that companies look for in a Web editor. 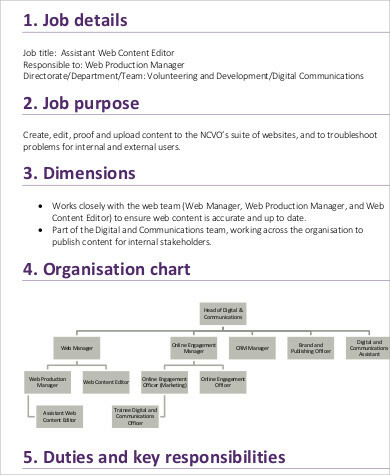 The skills and qualifications that each company looks for in a Web editor may vary depending on the needs and preference of the company. 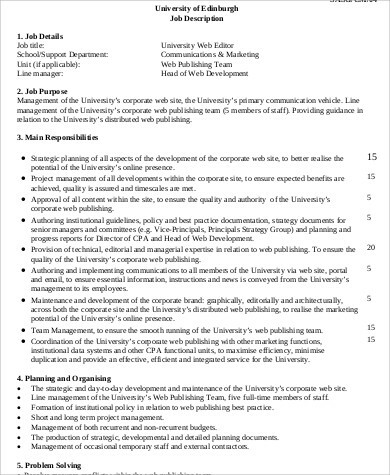 You can incorporate the sample skills listed here and on the template, you choose with that of your company’s preference in order to create an effective Web editor description that will be great for posting in job advertisements and job postings. Any job description must incorporate the following elements to make it an effective one. The location of the office or the location where the employee will be working in. This will include whether or not there is an actual office or if the employee will be working in a remote office setting. 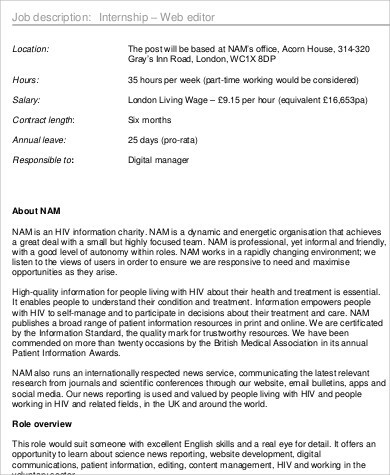 The description of the job. 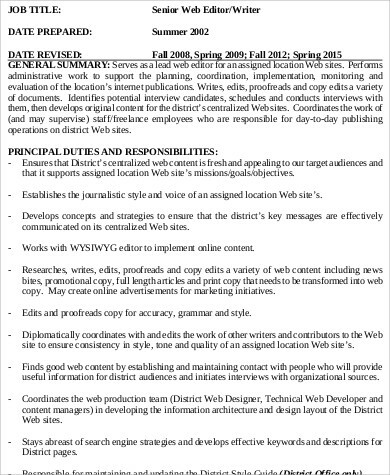 This part lists down what the Web editor’s duties and responsibilities are. 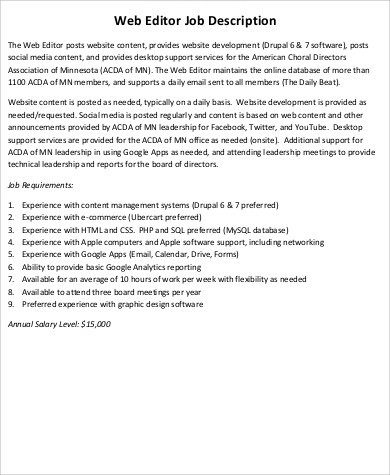 Requirements and qualifications. 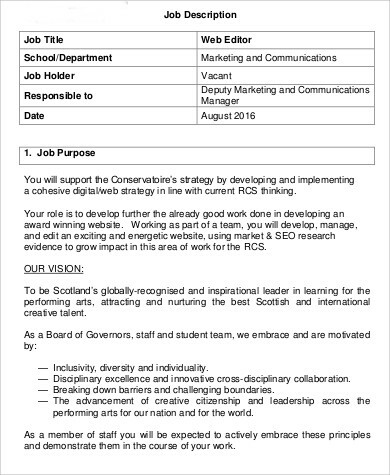 This will list down what the credentials needed to be a qualified candidate. 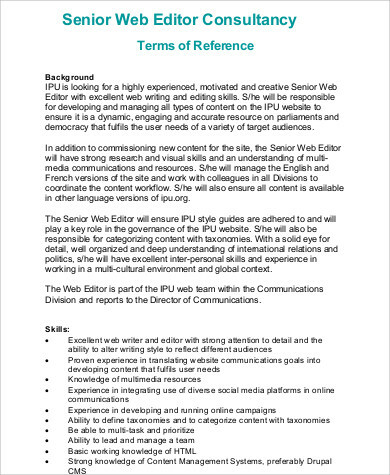 By listing down the job description of a Web editor, it ensures that the candidate understands what is expected of him/her should he/she be accepted for the job. There’s no format that is needed to be followed when writing job descriptions for various jobs, but being able to have a well-written one will help the candidate align himself/herself with the needs of the company. Use the templates available in this article and incorporate it into your company’s visions and goals. Just download these documents directly from this page and use these as your guideline. You may also look into Photo Editor Job Description.